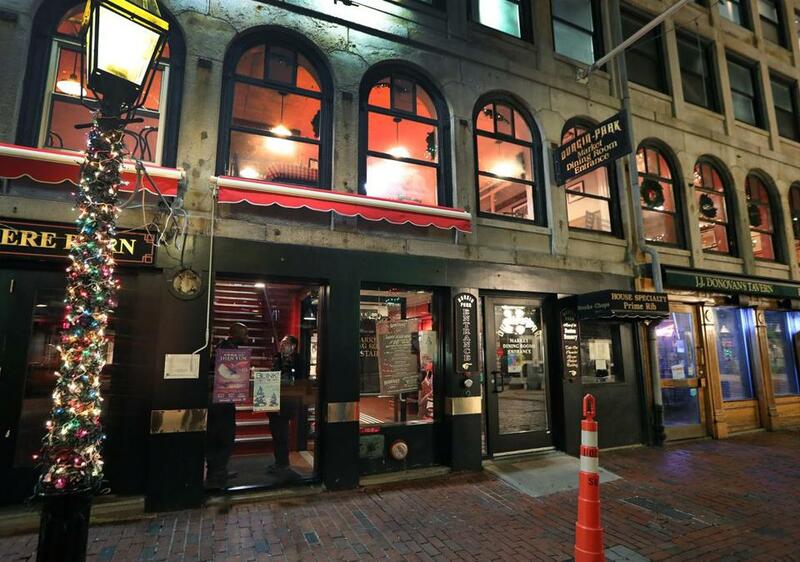 The Boston landmark Durgin-Park says it will close Jan. 12. Michael Weinstein, the chief executive of Ark Restaurants, which owns the 340 North Market St. eatery, also suggested that Faneuil Hall has lost traffic to other areas in Boston and customer counts are down. “I’m not happy about it, and we’re trying to look for a solution,” such as finding parties who might purchase the space, said Weinstein. Joe O’Malley, general manager of Faneuil Hall Marketplace, said in a statement Thursday, “Durgin-Park is still under a lease agreement with Faneuil Hall Marketplace. No formal closing notification has been submitted.” Attempts to glean further comment were unsuccessful Thursday night. 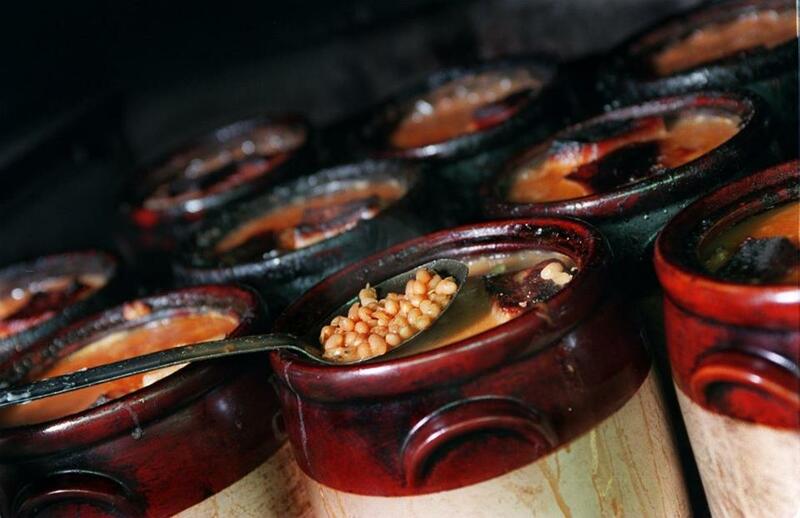 Ceramic pots filled of baked beans, molasses, salt pork and mustard baked for five and half hours at Durgin-Park . The establishment lays a claim to being one of the oldest restaurants in the city. It’s named after John Durgin and Eldridge Park, who along with John Chandler opened it in 1827. According to the Globe archives, before it was known as Durgin-Park, a restaurant in Faneuil Hall had catered to sailors on the waterfront and meat cutters of Quincy Market as far back as 1742. It has played host to such presidents as Theodore Roosevelt, Calvin Coolidge, and Franklin Delano Roosevelt, and it garnered a reputation for hearty cuts of roast beef, Boston baked beans, and its signature Indian pudding served on long tables covered with red checked tablecloths. Durgin-Park occupies several floors, including a basement bar called the HideOut, the street-level Gaslight Pub, a main dining room on the second floor, and another function room above that. The restaurant is also legendary for the all-in-good-fun gruff demeanor of its waitresses. “The waitresses, who seem to resent your presence, are rude and famous for it,” read one dispatch from The New York Times in 1985. “Durgin-Park, which dates to the 1820s, is famous for classic Boston cuisine, cramped family-style seating, and surly waitresses,” read one 2009 Globe report. 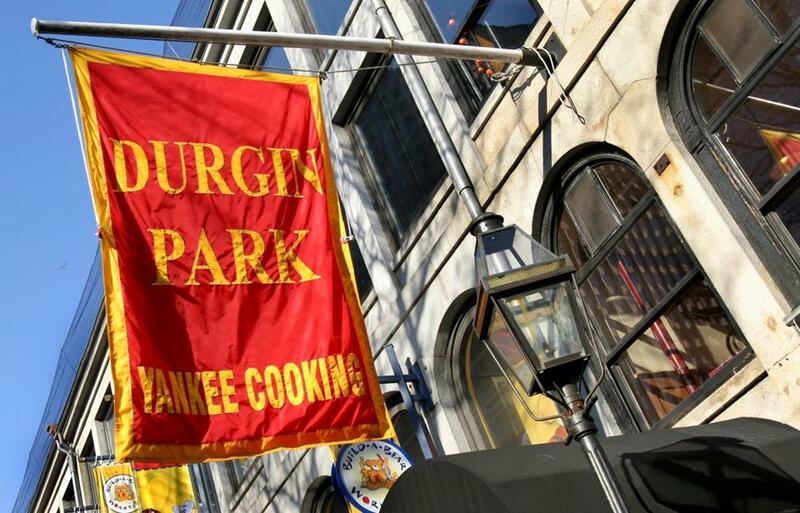 Durgin-Park would be the latest Boston culinary institution to shutter. Jacob Wirth Co., the historic beer hall founded by a German immigrant in 1868, was put up for sale last year. The Back Bay restaurant L’Espalier, known for its sophisticated fare and impeccable service, closed after 40 years on Dec. 31. Thursday found Durgin-Park’s staff, equipped with non-rhotic accents you could cut with a meat cleaver, in a friendly, albeit melancholy, mood. “It becomes part of your blood after a while,” she said. Schertzer also offered an explanation of the origin of the salty reputation of the waitstaff. 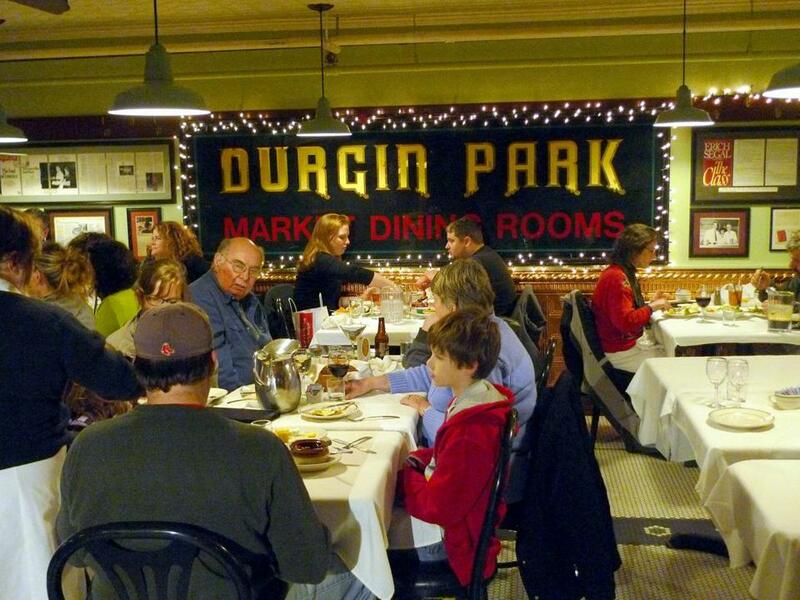 She said for decades, Durgin-Park served working-class patrons who toiled at third-shift jobs. They would give the staff attitude. The attitude was eventually returned in kind and became an ingrained part of the place’s charm, she said. Thursday evening found the ground-floor bar sparsely populated. A few patrons sipped from pint or martini glasses. 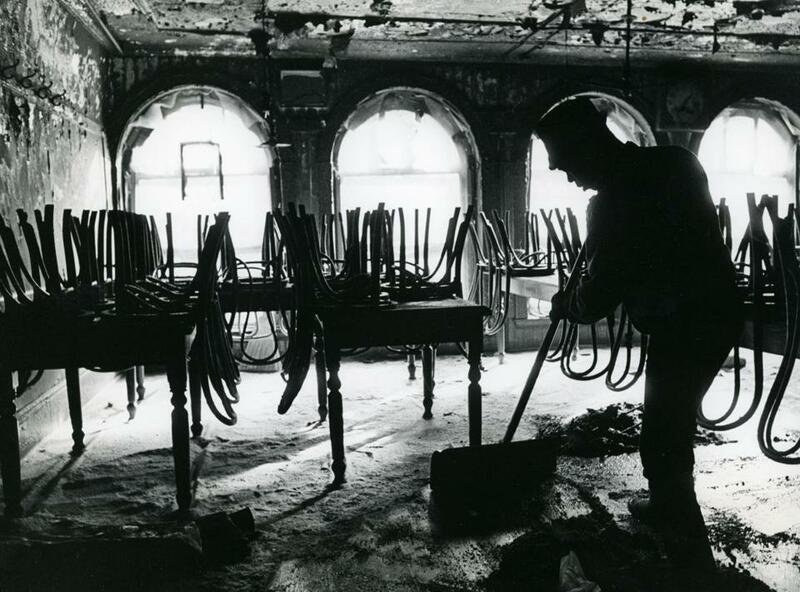 A person cleaned the inside of the burned dining room of Durgin-Park after a fire Feb. 7, 1968. Bartender Richelle Mazzone said she has not seen many changes during her 30 years working there. “They try to keep it the same, that’s why people come back all the time,” she said. The crowd is a mix, she said, lots of tourists, some Bruins and Celtics fans before or after games, and after-work lawyers and bankers. “It’s a fun place, you meet someone new every day,” said Mazzone, who lives in Peabody. She said she’s seen more competition in recent years in the restaurant and bar scene. “The younger kids like newer places, like the Seaport,” she said. She also suggested that maintenance costs were a problem. John Bell, who has worked nine years waiting tables and bartending at Durgin-Park, said he enjoyed seeing customers who have come to the restaurant for decades. “You feel connected to some of the people, it’s just the experience of the place,” said Bell, a Quincy native. Bell said the restaurant had not been keeping up with industry trends. Ciders, for instance, have become popular, but the bar did not carry a popular cider brand until the past year, he said. Sour beers have been trendy for more than a year, but the bar just got on board last month, he added. Tables are shared in the two upstairs dining rooms of Durgin-Park. “They weren’t developing with the times, they were just staying with what they had,” he said. He added that he would love to see someone buy the restaurant and make it work. One Bostonian who feels a connection to the restaurant was surprised by the news. Mark White, the son of the late Boston Mayor Kevin White, who during the 1970s reinjected new life into the deteriorating Quincy Market complex with the opening of Faneuil Hall Marketplace, said he was caught flat-footed by word that such a historic establishment was closing. “We ought to think twice about having a public conversation about closing it down like it’s a McDonald’s,” said White by phone. In the 1970s, Faneuil Hall represented a groundbreaking experiment for what an urban retail district could be, said White. It is now one of the more tangible parts of his father’s legacy. Durgin-Park is part of that history, White said. At the bar Thursday evening, Dillon McCarthy, a 30-year-old Natick resident who works in advertising, tucked into a plate of steak and potatoes, washing it down with Johnnie Walker, soda water, and a lime. He had never been to the restaurant before. Despite its location in the heart of a tourist hub, he said it felt authentic. “I feel like I’m right at home in here,” he said. Previous Globe coverage was used in this report. Danny McDonald can be reached at daniel.mcdonald@globe.com. Kara Baskin can be reached atkara.baskin@globe.com.